2000-12-12 First worldwide family litigation filed litigation Critical https://patents.darts-ip.com/?family=15949113&utm_source=google_patent&utm_medium=platform_link&utm_campaign=public_patent_search&patent=EP0522868(A1) "Global patent litigation dataset” by Darts-ip is licensed under a Creative Commons Attribution 4.0 International License. DNA encoding an endothelin receptor shown in SEQ ID NO: 1 or 2 in the Sequence Listing is isolated from cDNA which is prepared from poly(A)⁺RNA derived from a human placenta. In addition, an expression vector containing the DNA and a transformant containing the expression vector are obtained. An endothelin receptor is obtained by culturing this transformant. A receptor shown in SEQ ID NO: 1 is an ETA-receptor which has a high affinity for endothelins 1 and 2, especially for the endothelin 1. A receptor shown in SEQ ID NO: 2 is an ETB-receptor which has an affinity for endothelins 1, 2 and 3 with no selectivity. The present invention relates to a human endothelin receptor, DNA sequence encoding the receptor, an expression vector carrying the DNA sequence, a transformant comprising the expression vector, and a method for producing a human endothelin receptor from the transformant. An endothelin receptor (ET-receptor) is a receptor for an endothelin (ET). ET-receptors derived from animals such as bovines and rats have been known. An ET is a peptide present in various tissues in animals and is known as a strong vasoconstrictor. Cloning and sequence analysis of known ET genes have revealed that the ETs comprise three kinds of isopeptides: Endothelin 1 (ET-1), Endothelin 2 (ET-2), and Endothelin 3 (ET-3). Thereafter, it has been found that these ETs are distributed in a wide variety of vascular and non-vascular tissues (Proc. Natl. Acad. Sci. U.S.A. 86, 2863-2867 (1989); Trends in Pharmacol. Sci. 10, 374-378 (1989); and Proc. Natl. Acad. Sci. U.S.A. 87, 2359-2363 (1990)). ET-1 has initially been identified as a strong vasoconstrictive peptide with 21-amino-acid residues produced by porcine vascular endothelial cells (Nature, 332, 411-415 (1988)). It has previously been shown in vivo that ET-1 and ET-2 are much more strong vasoconstrictors than ET-3, whereas the three ET isopeptides are roughly equipotent in producing the transient vasodilation. As described above, the analysis of nucleic acid sequences of ETs has revealed that various kinds of ET isopeptides exist. These ET isopeptides are also different in their properties. Therefore, it appears that various subtypes of ET-receptors exist. The existence of various subtypes of ET-receptors has been proved by the radioactive ligand binding studies of Watanabe, H. et al. (Biochem. Biophys. Res. Commun., 161, 1252-1259 (1989)), and Martin, E. R. et al. (J. Biol. Chem. 265, 14044-14049 (1990)). These studies indicate the existence of, at least, two kinds of ET-receptors. One of them has a higher affinity for ET-1 and ET-2 than for ET-3; and the other has an affinity for ET-1, ET-2, and ET-3 with no selectivity. The ET-receptor is useful as a reagent for measuring the amount of ET or useful in screening for an antagonist of the ET-receptor so as to study agents for the circulatory system. Therefore, there is a demand for a structure analysis of the ET-receptor and effective production of the ET-receptor by means of genetic engineering using the information of this structural analysis. The human endothelin receptor of the present invention comprises amino acid sequence from Asp at +1 to Asn at +407 shown in SEQ ID NO: 1. The human endothelin receptor of the present invention comprises amino acid sequence from Met at -20 to Asn at +407 shown in SEQ ID NO: 1. The DNA sequence of the present invention encodes the human endothelin receptor comprising amino acid sequence from Asp at +1 to Asn at +407 shown in SEQ ID NO: 1. The human endothelin receptor of the present invention comprises amino acid sequence from Glu at +27 to Ser at +442 shown in SEQ ID NO: 2. The human endothelin receptor of the present invention comprises amino acid sequence from Met at +1 to Ser at +442 shown in SEQ ID NO: 2. The DNA sequence of the present invention encodes the human endothelin receptor comprising amino acid sequence from Glu at +27 to Ser at +442 shown in SEQ ID NO: 2. The expression vector of the present invention comprises the DNA sequence encoding the human endothelin receptor having amino acid sequence from Asp at +1 to Asn at +407 shown in SEQ ID NO: 1. The transformant of the present invention is obtained by introducing into a host cell the expression vector comprising the DNA sequence encoding the human endothelin receptor having amino acid sequence from Asp at +1 to Asn at +407 shown in SEQ ID NO: 1. The expression vector of the present invention comprises the DNA sequence encoding the human endothelin receptor having amino acid sequence from Glu at +27 to Ser at +442 shown in SEQ ID NO: 2. The transformant of the present invention is obtained by introducing into a host cell the expression vector comprising the DNA sequence encoding the human endothelin receptor having amino acid sequence from Glu at +27 to Ser at +442 shown in SEQ ID NO: 2. The method for producing a human endothelin receptor of the present invention comprises culturing either one of the above-mentioned transformants and recovering a produced endothelin receptor. Thus, the invention described herein makes possible the advantage of providing a human ET-receptor, DNA sequence encoding the ET-receptor, an expression vector carrying the DNA sequence, a transformant comprising the expression vector, and a method for producing an ET-receptor from the transformant. Figure 1 shows DNA coding sequence and deduced amino acid sequence of an ETA-receptor according to the present invention. Figure 2 shows DNA coding sequence and deduced amino acid sequence of an ETB-receptor according to the present invention. Figure 3 is a graph showing the results of a binding assay for determining the binding properties of the ETA-receptor to ET-1, ET-2, or ET-3. Figure 4 is a graph showing the results of a binding assay for determining the binding properties of the ETB-receptor to ET-1, ET-2, or ET-3. Figure 5 is a chart recording currents, which are generated at the time that ET-1 or ET-2 is applied to an oocyte of an Xenopus laevis injected with mRNA of the ETA-receptor according to the present invention. Figure 6 is a chart of autoradiography showing the results of hybridization of mRNAs isolated from a human tissue with a cDNA fragment of the ETA-receptor according to the present invention. Figure 7 is a chart of autoradiography showing the results of hybridization of mRNA isolated from a human tissue with a cDNA fragment of the ETB-receptor according to the present invention. Figure 8 is a restriction map of DNA sequence of the ETB-receptor according to the present invention. The inventors succeeded in isolating a human ET-receptor cDNA from a cDNA library constructed from poly(A)⁺RNA derived from a human placenta, thereby achieving the present invention. The present invention will be described below in order of the steps involved. First, cDNA prepared from poly(A)⁺RNA derived from a human placenta, by using oligo(dT)-primer, is introduced into phage λ ZAPII to construct a cDNA library (Sambrook et al., Molecular Cloning: A Laboratory Manual, Cold Spring Harbor Laboratory, New York (1989)). Then, the cDNA library is screened with the use of DNA fragment of a known ET-receptor as a probe. For example, the cDNA library is screened by hybridizing a probe, an NcoI-EcoRI fragment (960 bp) of DNA encoding a bovine ET-1 receptor, with the cDNA library to obtain positive plasmid clone phETIR. In addition, the cDNA library is hybridized under less stringent conditions to obtain pHETBR1, pHETBR20, pHETBR31 and pHETBR34. cDNA inserts contained in these clones are cut with appropriate restriction enzymes and subcloned, after which these cDNA inserts are sequenced by the dideoxy chain termination method. 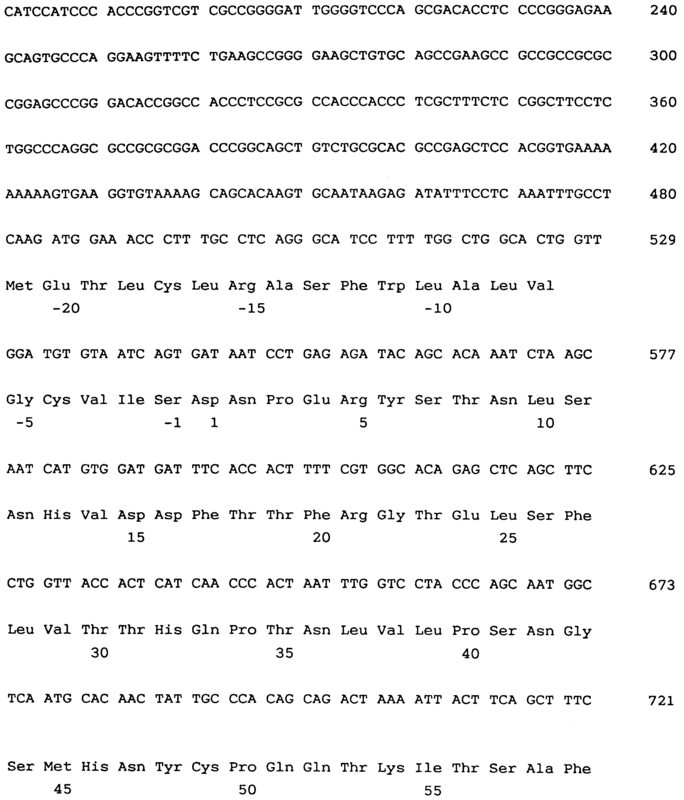 The nucleic acid sequence of the human ET-receptor thus obtained from phETIR and amino acid sequence corresponding thereto are shown in SEQ ID NO: 1 in a Sequence Listing. The nucleic acid sequence of the human ET-receptor thus obtained from pHETBR31 and pHETBR34 and amino acid sequence corresponding thereto are shown in SEQ ID NO: 2 in Sequence Listing. A restriction map of the nucleic acid sequence in SEQ ID NO: 2 is shown in Figure 8. 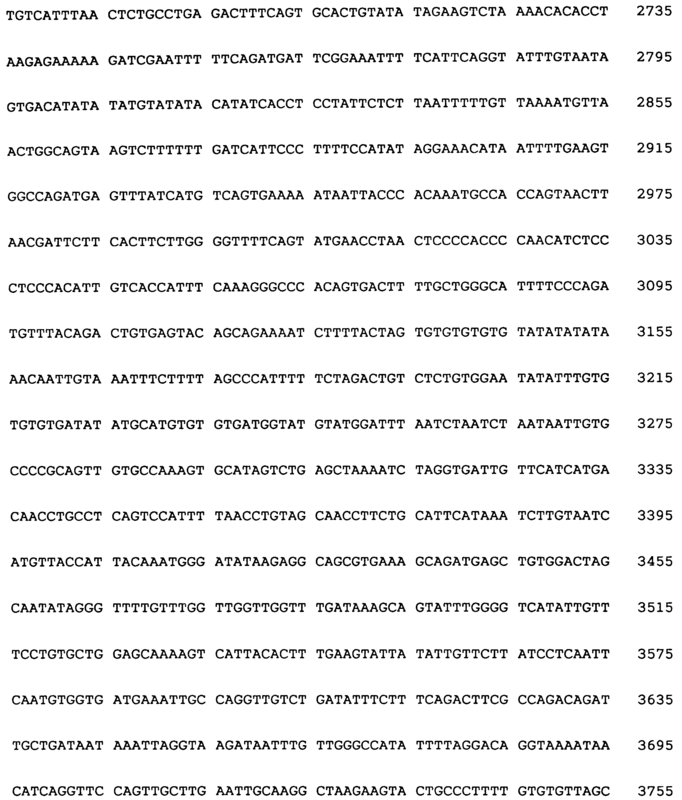 The positions of 3′ termini of the inserts contained in pHETBR31 and pHETBR1 are respectively marked with a double line and a wave line in the sequence of Figure 2. The ET-receptor encoded by DNA shown in SEQ ID NO: 1 is a receptor having an affinity for ET-1 and ET-2 (ETA-receptor). The ET-receptor encoded by DNA shown in SEQ ID NO: 2 is a receptor having an affinity (with no selectivity) for both ET-1, ET-2, and ET-3 (ETB-receptor). As shown in SEQ ID NO: 1 and Figure 1, cDNA contained in the above-mentioned plasmid clone phETIR has a sequence comprising 4,105 nucleic acids. 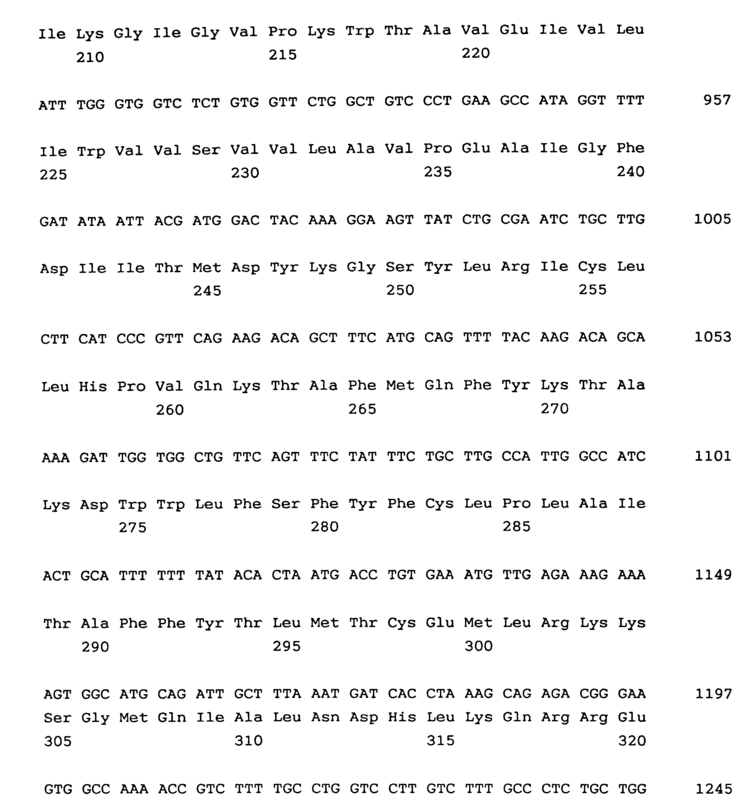 In this nucleic acid sequence, an open reading frame from A at 485 to A at 1768 are constituted, which encodes a 427-amino-acid protein with a molecular weight of 48,726. 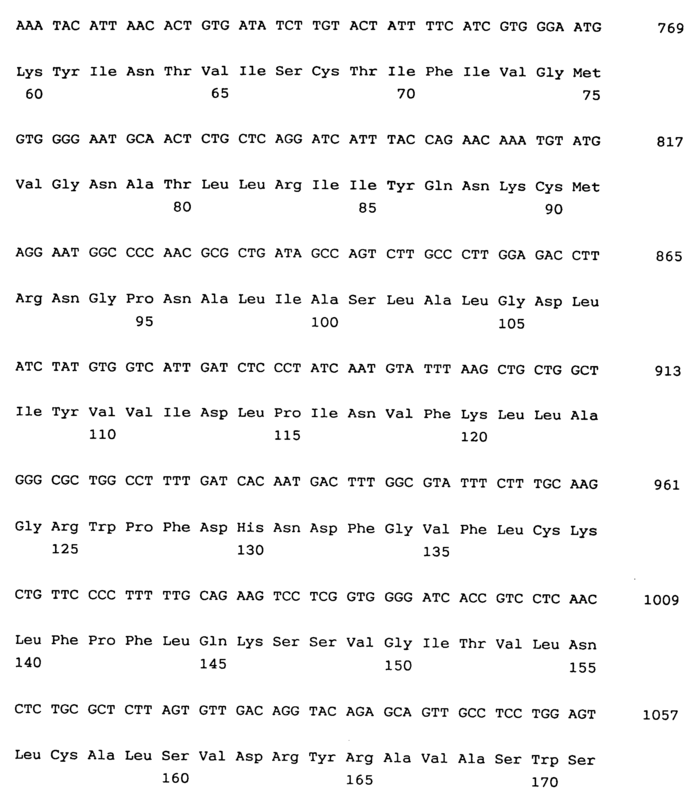 A sequence adjacent to the initiation codon of the open reading frame is quite consistent with a consensus sequence. A peptide consisting of amino acids from Met corresponding to the initiation codon to the 20th amino acid from Met may be a signal sequence. A 3′-noncoding region contains ATTTA sequence (underlined in the noncoding region of the sequences in Figure 1), which are related with instability of mRNA. There is a potential polyadenylation signal 22-nucleotides upstream of the poly(A)⁺ tail (broken underlined in Figure 1). Hydropathicity analysis of the amino acids constituting the protein encoded by this cDNA indicates that there are seven hydrophobic clusters of 22-26 residues in the protein, each being separated by hydrophilic amino acid sequences. As described above, the protein has seven transmembrane domains, and these domains have an extracellular N tail and a cytoplasmic C tail. The characteristics of this protein are consistent with those of the superfamily of G protein-coupled receptors. These seven transmembrane domains are shown as I to VII in the sequences of Figure 1. In the above-mentioned cDNA, there are several potential sites for post-translational modification, and these sites are identical to those of the bovine ET-1 receptor. 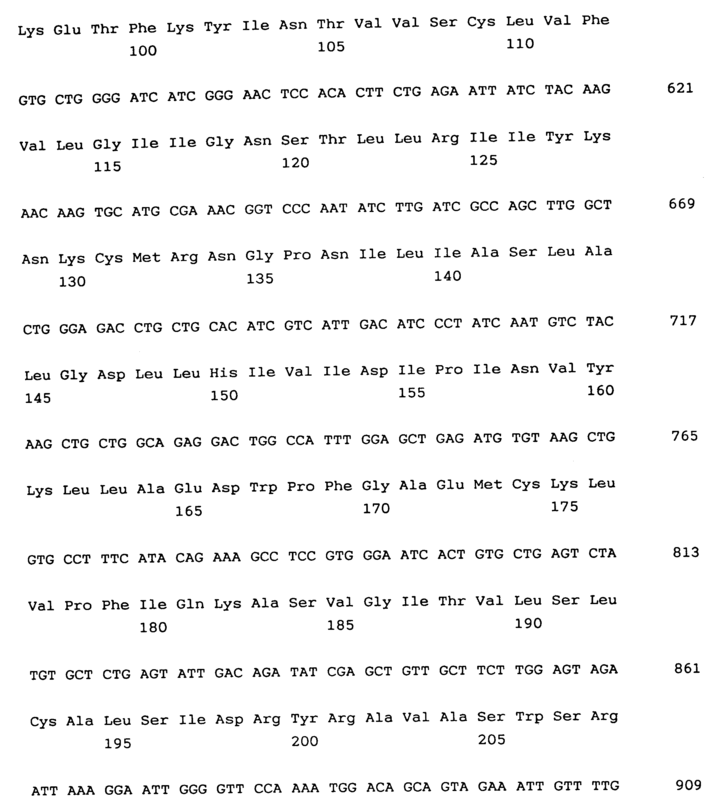 They include two consensus sequences for N-glycosylation, Asn at 9 and 42 (shown by reverse triangles in Figure 1); six cysteine residues present on the N terminus side of the cytoplasmic C tail (359, 363, and 365 to 368), one of which may be palmitoylated as in the β₂-adrenergic receptor; and serine residues that can be phosphorylated with serine/threonine kinases (shown by solid circles in Figure 1). The nucleic acid sequence of the open reading frame of cDNA obtained from phETIR is 91.2% homologous to that of bovine ET-1 receptor cDNA. As shown in SEQ ID NO: 2 and Figure 2, cDNA obtained from the above two plasmid clones has a sequence comprising 4,301 nucleic acids. 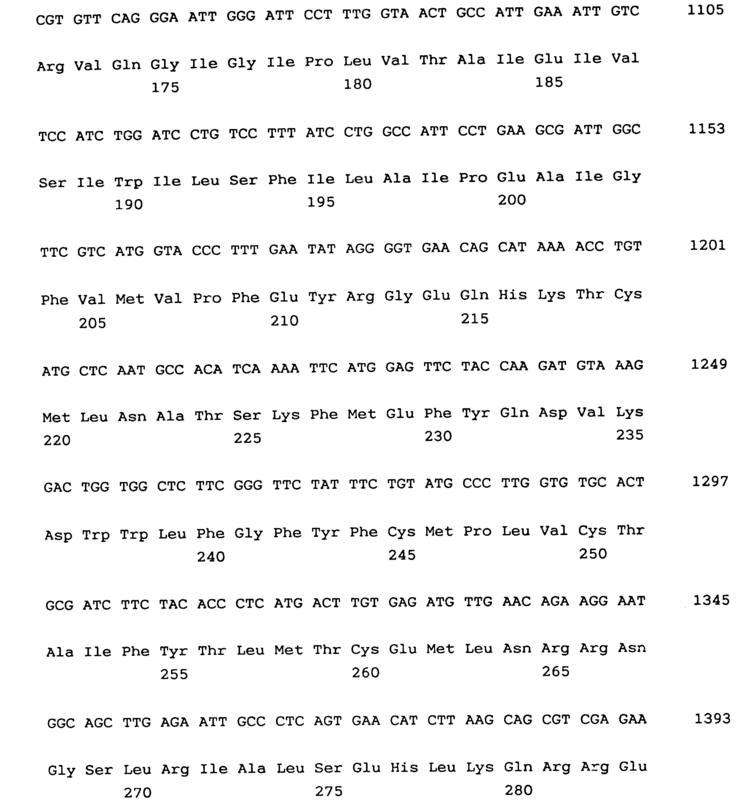 In this nucleic acid sequence, an open reading frame from A at 238 to A at 1566 exists, which encodes a 442-amino acid protein with a molecular weight of 49,629. 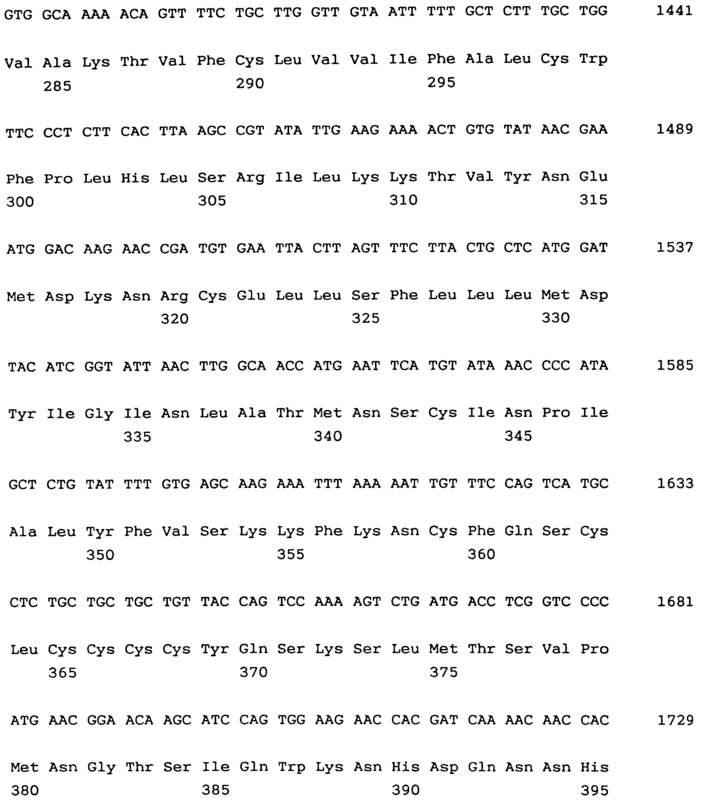 A sequence adjacent to the initiation codon of the open reading frame is quite consistent with a consensus sequence. A peptide consisting of amino acids from Met corresponding to the initiation codon to the 26th amino acid from Met may be a signal sequence. In the same way as in the DNA sequence of the ETA-receptor derived from the above-mentioned phETIR, an ATTTA sequence, seven transmembrane domains (I to VII), a polyadenylation signal, N-glycosylation sites, and serine residues that can be phosphorylated with serine/threonine kinases are shown in the sequences of Figure 2. Recently, Sakurai et al. 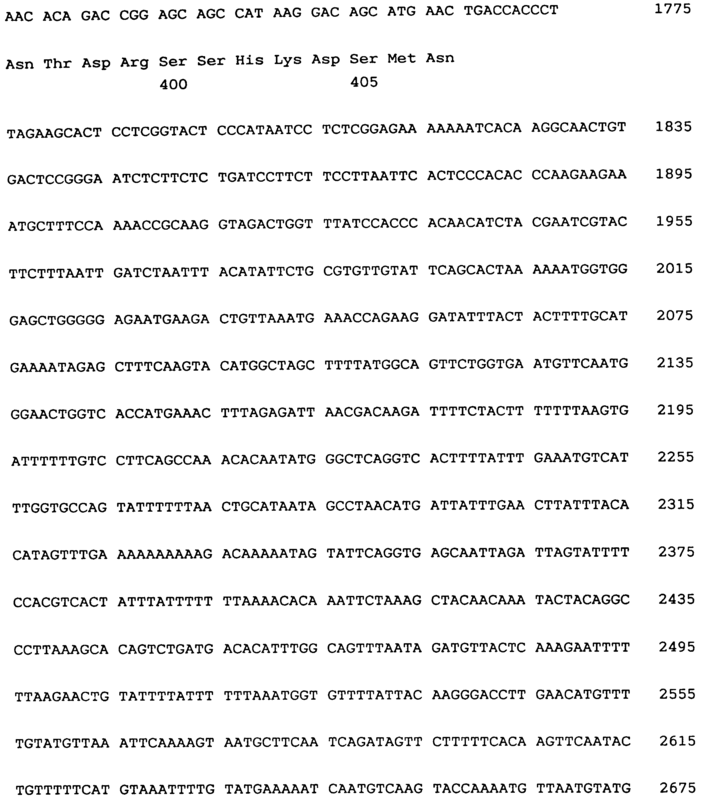 cloned cDNA encoding the ET-receptor of an ETB type from a rat lung (Nature, 348, 732-735 (1990)). The amino acid sequence of ETB-receptor from a rat is 88% homologous to that of the ET-receptor shown in SEQ ID NO: 2, and is 51.9% homologous to that of the ET-receptor shown in SEQ ID NO: 1. The amino acid sequence of the ETA-receptor shown in SEQ ID NO: 1 is 55% homologous to that of the ETB-receptor shown in SEQ ID NO: 2. 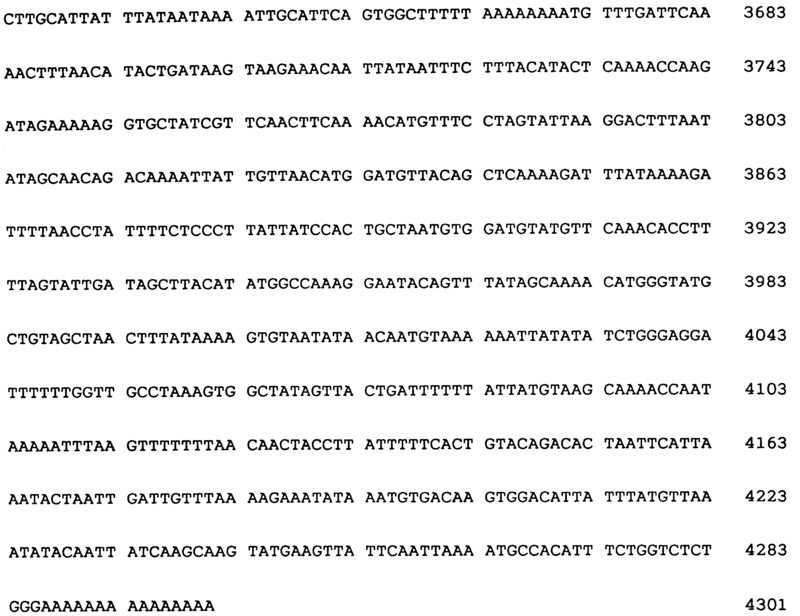 The open reading frame of the DNA sequence encoding the ETB-receptor shown in SEQ ID NO: 2 is 61.1% homologous to that of the bovine ETA-receptor. cDNAs encoding the above-mentioned ET-receptors are introduced into appropriate vectors to construct expression vectors. 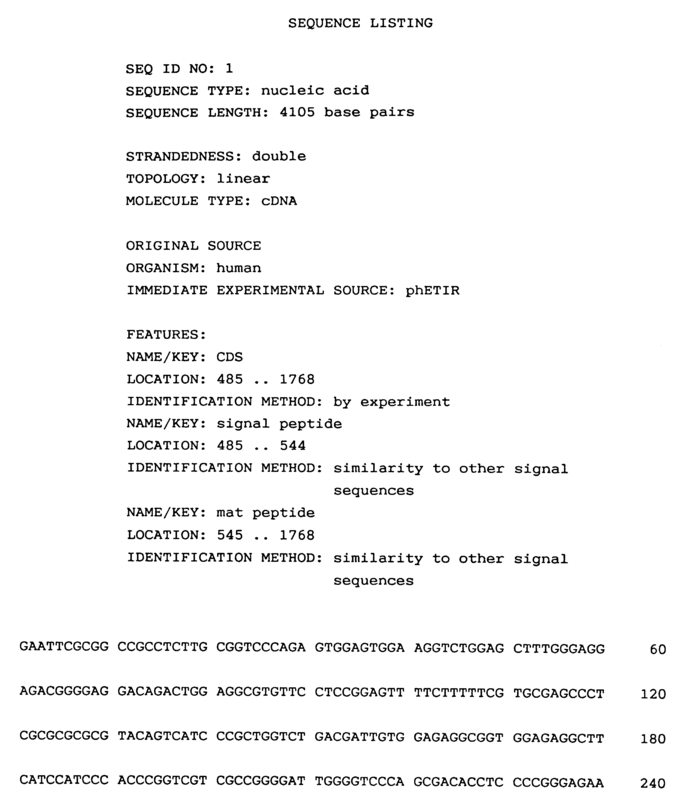 For example, a NotI fragment of the phETIR can be introduced into CDM8 (Nature, 329, 840-842 (1987)), to obtain an expression vector CDM8-phETIR. In the same way, an XbaI fragment of pHETBR34 can be introduced into CDM8 to obtain an expression vector CDM8-pHETBR. These expression vectors can be introduced into appropriate host cells to obtain transformants. For example, a transformant capable of producing an ET-receptor can be obtained by transfecting one of the above-mentioned expression vectors into a COS-7 cell. An ET-receptor is produced by culturing the transformed COS-7 cell under normal conditions. The ET-receptor is expressed (produced) on the cell surface. The produced ET-receptor can be purified by, for example, combinations of various kinds of chromatographies. The ET-receptor thus produced from a transformant is subjected to a binding assay by the use of known ETs and is confirmed to be an ET-receptor. In addition, it is confirmed which endothelin: ET-1, ET-2, or ET-3 the ET-receptor is specifically bound to. For example, first, a predetermined amount of ET-receptor produced by the COS cell transformed with the CDM8-phETIR is added to a mixture of a predetermined amount of ET-1 labeled with ¹²⁵I (¹²⁵I-ET-1) and unlabeled ET-1 and to allow to react. Then, the amount of labeled binding complex thus produced is measured. In Figure 3, the amount of unlabeled ET-1 is plotted on a horizontal axis by changing the concentration thereof in the range of 10⁻¹⁰ to 10⁻⁶ M, and the radioactivity of an ET-ET-receptor complex (radioactivity of the ET bound to the transformed cell) is plotted on a vertical axis (represented by the symbol ● ). Results obtained by performing a competitive assay using unlabeled ET-2 or ET-3 instead of unlabeled ET-1 in the same way as the above are also shown in Figure 3 (represented by the symbol ■ (ET-2) and ▲ (ET-3)). The COS-7 cell obtained by transfecting the CDM8, which is a control plasmid, is cultured and is tested in the same way as the above. The binding amount of ¹²⁵I-ET-1 is the same level as the amount of non-specific ¹²⁵I-ET-1 measured in the presence of an excessive amount of unlabeled ET-1 (the results are not shown). These results indicate that the affinity of the ET-receptor from phETIR according to the present invention for the ET is ET-1 (IC₅₀ 3.0 x 10⁻⁹ M) ≧ ET-2 (IC₅₀ 6.1 x 10⁻⁹ M) >> ET-3 (IC₅₀ 1.0 x 10⁻⁶ M or more), suggesting that this ET-receptor is the ETA-receptor. The same procedure of binding assay as described above is done for the ET-receptor produced from the COS cell transformed with the CDM8-pHETBR. The results are shown in Figure 4 (represented by the symbols ● (ET-I), ○ (ET-2), and ▲ (ET-3)). IC₅₀ is about 1.0 x 10⁻⁹ M, suggesting that this ET-receptor is the ETB-receptor. mRNA is synthesized from the cDNA of the ET-receptor of the present invention. When the synthesized mRNA is injected into an appropriate cell, for example, an oocyte of an Xenopus laevis, an ET-receptor is expressed in the cell membrane. For example, mRNA is synthesized from cDNA shown in SEQ ID NO: 1 obtained in item (I) with the use of T7RNA polymerase. The synthesized mRNA is injected into an oocyte of an Xenopus laevis; as a result, an ETA-receptor is produced in the cell memblene. The production of an ETA-receptor is confirmed by the following procedure. First, the membrane potential of the oocyte injected with mRNA is held at a predetermined value, and then this oocyte is brought into contact with a solution containing ET-1. If the ETA-receptor of the present invention is produced, it is expressed on the cell surface, thus bound to ET-1 present outside the cell. When the ETA-receptor is bound to ET-1, a current flows toward the inside of the cell. Therefore, the production of the ET-receptor of the present invention is confirmed by measuring this current. When the oocyte was brought into contact with a solution containing 10⁻⁷ M ET-1, a current of a large value is confirmed to flow toward the inside of the cell. When the oocyte was brought into contact with a solution containing 10⁻⁷ M ET-2 instead of ET-1, the same value of current is confirmed to flow. In contrast, when the oocyte is brought into contact with a solution containing ET-3, only a small value of current is confirmed to flow. The comparison in current values between ET-1 and ET-3 is shown in Figure 5. From this result, the ETA-receptor of the present invention has a higher affinity for ET-1 than for ET-3. Northern blot hybridization analysis is conducted on mRNA isolated from various human tissues by using, as a probe, DNA fragment encoding the ETA-receptor of the present invention (EcoRV-EcoRI fragment from phETIR; nucleic acids 739-1564, 826 bp) which is radio-labeled, resulting in a single positive band with a size of 4.3 kb. The results are shown in Figure 6. The ETA-receptor mRNA of the present invention is present in the aorta at the highest levels; in the lung, atrium, colon and placenta at high levels; and in the cerebral cortex, cerebellum, ventricle, kidney, adrenal and duodenum at moderate levels. A hybridized band is not found in the liver or in the cultured human umbilical vein endothelial cell. As described above, the ETA-receptor mRNA is present in the circulatory system, especially in the aorta at the highest levels. Since the ET-receptor mRNA is not present in the endthelial cell, the ETA-receptor mRNA is possibly expressed in the vascular smooth muscle cell. Martin et al. describes in J. Biol. Chem. 265, 14044-14049 (1990) that ET-1 and ET-2 inhibit the binding of ¹²⁵I-ET-1 to a rat A-10 vascular smooth muscle cell. This result is consistent with the experimental results that the ETA-receptor of the present invention is present in the vascular smooth muscle cell. The ETA-receptor of the present invention appears to be a main subtype of the ET-receptor which is expressed in the vascular smooth muscle cell. In general, it is known that the concentration of ET-1 in plasma is increased due to various diseases such as essential hypertension, vasospastic stenocardia, acute myocardial infarction, chronic renal insufficiency, subarachnoid hemorrhage, and hypoxia. It is conceivable that ET-1 produced in and released from the endothelial cells is bound to an ET-receptor in the vascular smooth muscle cells and acts as a local regulator in maintaining vascular tonus. It is conjectured that the increase in concentration of ET-1 due to the above-mentioned diseases is caused by the collapse of balance between the amount of ET-1 bound to the ET-receptor and the amount of ET-1 released. Northern blot hybridization is conducted as described in item (1), by using a probe, 1.2 kb EcoRI fragment, which is derived from pHETBR34 and is radio-labeled, resulting in that a band with a size of 4.3 kb and a band with a size of 1.7 kb are found in various tissues as shown in Figure 7. It is considered that the plurality of mRNAs is due to the difference in polyadenylation. It is found that mRNAs with a size of 4.3 kb and 1.7 kb are expressed in the human cerebral cortex and cerebellum at high levels and in the placenta, lung, kidney, adrenal, colon and duodenum at moderate levels. Hereinafter, the present invention will be described by way of illustrating examples. First, cDNA prepared from poly(A)⁺RNA derived from a human placenta, by using oligo(dT)-primer, was introduced into phage λ ZAPII, to construct a cDNA library (Sambrook et al., Molecular Cloning: A laboratory Manual, Cold Spring Harbor Laboratory, New York (1989)). 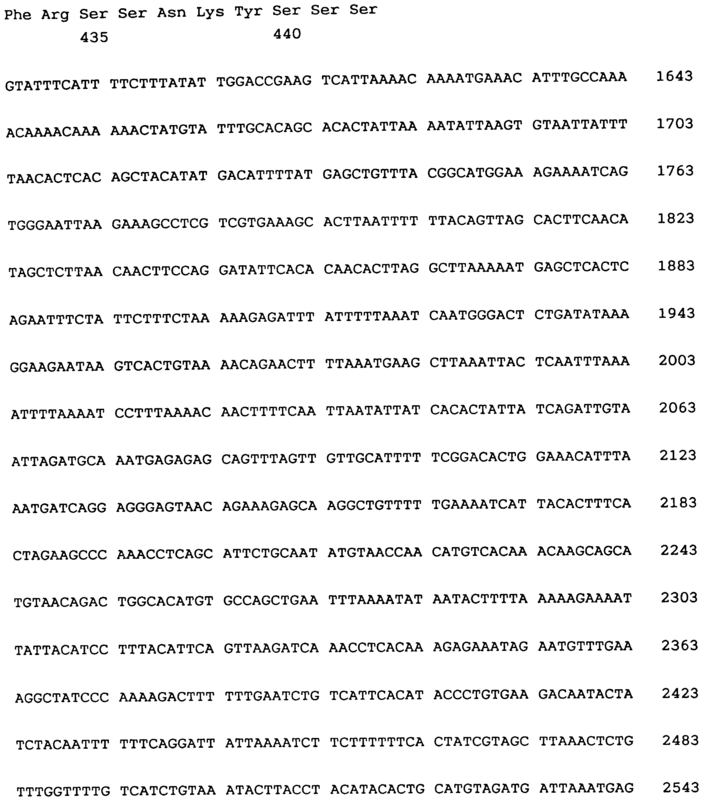 Approximately 1 x 10⁶ plaques were screened by using an NcoI-EcoRI fragment (960 bp) of DNA encoding a bovine ET-1 receptor as a probe (Nature, 348, 730-732 (1990)) in the following manner. Filters (Colony/Plaque Screen, du Pont, Wilmington, DE) to which plaques were replicated were prehybridized for 6 hours in a solution containing 1% SDS, 1 M NaCl, 10% dextran sulfate, 200 µg/ml of yeast tRNA and 250 µg/ml of denatured salmon sperm DNA. Then the filters were hybridized at 65°C for 18 hours with the probe (NcoI-EcoRI fragment) labeled by random-primed synthesis to the specific activity of 5 x 10⁸ cpm/1 µg DNA. The filters were then washed twice (30 min. per wash) in 0.2 x SSC (1 x SSC is 0.15 M NaCl, 15 mM sodium citrate (pH 7.0)) containing 0.1% SDS at 60°C. The resulting filters were subjected to autoradiography in which the filters were overlayered with Konica enhancing screens and Konica X-ray films (Konica, Tokyo, Japan) and left for 4 hours at -80°C. As a result, a plurality of clones which were hybridized with the probe were found. Fragments of the cDNA insert of phETIR were subcloned into the Bluescript plasmid vector (Stratagene, La Jolla, CA). Both strands (+ -) of the cDNA insert were sequenced by the dideoxy chain termination method using Sequenase (United States Biochemical Corp., Cleveland, OH). The nucleic acid sequence and a deduced amino acid sequence of the human ET-receptor obtained from phETIR are shown in SEQ ID NO: 1. In the same way as in item (1), cDNA prepared from poly(A)⁺RNA derived from a human placenta, by using oligo(dT)-primer, was introduced into phage λ ZAPII to construct a cDNA library. The approximately 1 x 10⁶ plaques produced were screened using the same probe used in item (1) under conditions different from those in item (1). Filters to which plaques were replicated were immersed in a solution containing 1% SDS, 1 M NaCl, 10% dextran sulfate, 200 µg/ml of yeast RNA and 250 µg/ml of denatured salmon sperm DNA, and the plaques were hybridized with the probe at 65°C for 18 hours. The filters were then washed twice (30 min. per wash) in 0.5 x SSC containing 0.1% SDS at 50°C. The resulting filters were subjected to autoradiography to detect positive clones. Three out of 20 positive clones were clones which became positive even under the highly stringent conditions of hybridization described in item (1) above, and therefore, these three clones are cDNAs of ETA-receptors. Plasmids obtained from the remaining 17 clones were cut with appropriate restriction enzymes and were sequenced by the dideoxy chain termination. As a result, a cDNA sequence shown in SEQ ID NO: 2 was identified from pHETBR31 and pHETBR34. A NotI fragment of the phETIR obtained in item (I) was introduced into a CDM8 (Nature, 329, 840-842 (1987) to obtain an expression vector, CDM8-phETIR. COS-7 cells maintained in Dulbecco's modified Eagle's medium supplemented with 100 U/ml of penicillin and streptomycin and fetal bovine serum (Hazleton, Lenexa, KS) were transfected with the CDM8-phETIR, by a calcium phosphate method. Separately, the COS-7 cells were transfected with the control plasmid CDM8. Twenty micrograms of DNA per 100 mm plate were used for transfection. The transfected cells were treated with 20% glycerol for 4 hours after the transfection. Four hours after the glycerol treatment, the cells were harvested from 100 mm plates and 5 x 10⁴ cells/well were plated on a 24-well cell culture plate (Corning, Glass Co. Corning, NY). An XbaI fragment (2.7 kb) of the pHETBR34 obtained in item (I) was introduced into the CDM8 to obtain an expression vector, CDM8-pHETBR. In the same way as described in item (1), this vector was introduced into a COS-7 cell and cultured. ¹²⁵I-ET-1 (¹²⁵I-labeled ET-1) (2000 Ci/mmol) was purchased from Amersham (Buckinghamshire, UK). Unlabeled ET-1, ET-2 and ET-3 were purchased from Peptide Institute Inc. (Minoh, Japan). Confluent cells in the wells (48 hours after the glycerol treatment) were washed three times with 1 ml of Hank's balanced salt solution containing 0.1% bovine serum albumin (BSA) (binding medium). A solution containing 50 pM of ¹²⁵I-ET-1 and various concentrations (10⁻¹⁰ to 10⁻⁶ M) of ET-1 was added to each well. Separately, a solution containing ET-2 or ET-3 instead of ET-1 and a solution containing ¹²⁵I-ET-1 alone were prepared, and were respectively added to each well. These solutions added to the wells were incubated at 37°C for 60 min. Following three washings with 1 ml of ice-cold binding medium, the cells were dissolved in 0.5 ml of 1 N NaOH. The cell-bound radioactivity was measured by an autogamma counter (Aloka, Tokyo, Japan). The total binding was calculated as follows: (the radioactivity in the absence of unlabeled ET-1, ET-2 or ET-3) - (the radioactivity in the presence of 4 x 10⁻⁷ M unlabeled ET-1). All measurements were conducted twice. As a result, the total binding of ¹²⁵I-ET-1 was 6900 cpm (background binding in the presence of 4 x 10⁻⁷ M ET-1 was 150 cpm). The radioactivity in the presence of ET-1, ET-2, or ET-3 in various concentrations is represented in per cent of the total binding (6900 cpm). The results are shown in Figure 3. It is understood from Figure 3 that the affinity of the ET-receptor derived from the phETIR of the present invention for ETs is ET-1 (IC₅₀ 3.0 x 10⁻⁹ M) ≧ ET-2 (IC₅₀ 6.1 x 10⁻⁹) >> ET-3 (IC₅₀ 1 x 10⁻⁶ M or more). Binding assays were performed in the same way as described in item (1) using a transformant containing the CDM8-pHETBR instead of a transformant containing the CDM8-phETIR. The results are shown in Figure 4. In Figure 4, ○ shows the radioactivity in the presence of ET-2; ● shows the radioactivity in the presence of ET-1; and ▲ shows the radioactivity in the presence of ET-3. It is understood from Figure 4 that this receptor has almost the same affinity for ET-1, ET-2 and ET-3. Approximately 10 mg of mRNA was synthesized in vitro from phETIR by using T7RNA polymerase in the presence of capping nucleotides. The mRNA thus obtained was pressure-injected into oocytes of an Xenopus laevis with a pipette. The oocytes were then incubated in sterile Barth's medium at 20°C for 3 days. Electro-physiological measurements were performed at 20°C in an ND96 solution (96 mM NaCl, 2 mM KCl, 1 mM MgCl₂, 5 mM Hepes, pH 7.6). Two glass microelectrodes filled with 4 M potassium acetate solution were inserted into an oocyte, and the membrane potential was held at -60 mV. To this oocyte, 1 x 10⁻⁷ M ET-1, ET-2, or ET-3 desolved in the ND 96 solution containing 0.1% Triton X-100 and 0.1% gelatin were applied. Twenty seconds after the application of the ET-1 solution, a large inward current was recorded from the oocytes under a holding potential at -60 mV. The chart recorded is shown in Figure 5. A similar inward current was recorded when 1 x 10⁻⁷ M ET-2 was applied (not shown). In contrast, a much smaller current was recorded when 1 x 10⁻⁷ M ET-3 was applied (Figure 5). The currents caused by the ETs were fluctuating and long-lasting, and were characteristic of Ca²⁺-activated chloride currents. No currents were recorded when the medium alone (ND9 solution containing 0.1% Triton X-100 and 0.1% gelatin) was applied (Figure 7). It is understood from the above results that the ET-receptor derived from the phETIR of the present invention has a higher affinity for ET-1 or ET-2 than for ET-3. Among the human tissues used herein, the cerebral cortex, cerebellum, aorta, lung, atrium, liver, kidney, adrenal, duodenum, colon and placenta were obtained from an autopsy or operation. These tissues were weighed, frozen in liquid nitrogen, and stored at -70°C until used. Human umbilical vein endothelial cells were purchased from Colonetics Corp (San Diego, CA), and cultured as described in Lab. Invest. 63, 115-122 (1990). Total RNA was isolated from each tissue by a guanidinium isocyanate/cesium chloride method. Total RNA was separated on 0.66 M formaldehyde-1% agarose gels (20 µg per lane), and transferred to a nylon membrane (Pall, Glen, Cove, NY) in 20 x SSC. Blots were fixed by UV cross-linking and were prehybridized at 65°C for 12 hours in a solution containing 4 x SSC, 10 x Denhardt's solution (1 x Denhardt's solution is 0.2% polyvinylpyrrolidone, 0.2% BSA, and 0.2% Ficoll), 0.5% SDS, and 250 µg/ml of denatured salmon sperm DNA. The blots were then hybridized at 42°C for 4 hours in a solution containing 50% formamide, 4 x SSC, 5 x Denhardt's solution, 0.5% SDS, 10% dextran sulfate, 250 µg/ml of denatured salmon sperm DNA, and the radio-labeled EcoRV-EcoRI fragment of the insert of phETIR (826 bp; used as a probe). The probe was labeled by random-primed synthesis to the specific activity of 1 x 10⁹ cpm/µg DNA. The blots were washed twice at room temperature (30 min. per wash): once at 60°C in a solution containing 2 x SSC and 0.1% SDS (30 min. per wash) and twice at 60°C in a solution containing 0.1 x SSC and 0.1% SDS (15 min. per wash). The resulting blots were subjected to autoradiography in which filters carrying blots were overlayered with Konica enhancing screens and Kodak X-Omat AR film (Kodak, Corp. Rochester, NY) and left for 3 days at -70°C. The results are shown in Figure 6. A single band with a size of 4.3 kb is located in various tissues, suggesting that mRNAs of the ET-receptor of the present invention are present in various tissues. In particular, the mRNAs are present in the aorta at the highest levels; in the lung, atrium, colon, and placenta at high levels; and in the cerebral cortex, cerebellum, ventricle, kidney, adrenal, and duodenum at moderate levels. A hybridized band is not found in the liver and in the cultured human umbilical vein endothelial cell. Autoradiography was performed in the same way as described in item (1) above, except that the radio-labeled EcoRI fragment (1.2 kb) of the insert of pHETBR34 was used as a probe instead of the radio-labeled EcoRV-EcoRI fragment of the insert of pHETIR. The results are shown in Figure 7. As shown in Figure 7, bands with a size of about 4.3 kb and 1.7 kb are located. It is understood that the ETB-receptor mRNA is present in the cerebral cortex and cerebellum at high levels. In addition, unlike the ETA-receptor, the ETB-receptor mRNA is present in the umbilical vein endothelial cell. As described above, according to the present invention, a novel human endothelin receptor, DNA sequence encoding the receptor, an expression vector having the DNA sequence, a transformant comprising the expression vector, and a method for producing a human endothelin receptor from the transformant are provided. The receptor shown in SEQ ID NO: 1 is an ETA-receptor which has an affinity for ET-1 and ET-2, especially the affinity for ET-1 being stronger. The receptor shown in SEQ ID NO: 2 is an ETB-recetor which has an affinity for ET-1, ET-2 and ET-3 (with no selectivity). Thus, it is the first time that both an ETA-receptor and an ETB-receptor are found in a specific mammal. The ET-receptors obtained are useful as an agent for measuring the amount of ET or useful in screening for an antagonist of the ET-receptors so as to study agents for the circulatory system. The following specific sequence information and descriptions are provided in order to comply with the formal requirements of the submission of sequence data to the United States Patent and Trademark Office and are not intended to limit the scope of what the inventors regard as their invention. Variations in sequences which become apparent to those skilled in the art upon review of this disclosure and which are encompassed by the attached claims are intended to be within the scope of the present invention. Further, it should be noted that efforts have been made to insure accuracy with respect to the specific sequences and characteristic description information describing such sequences, but some experimental error and/or deviation should be accounted for. A human endothelin receptor comprising amino acid sequence from Asp at +1 to Asn at +407 shown in SEQ ID NO: 1. A human endothelin receptor comprising amino acid sequence from Met at -20 to Asn at +407 shown in SEQ ID NO: 1. A DNA sequence encoding the human endothelin receptor according to claim 1. A DNA sequence according to claim 3, comprising a nucleic acid sequence from G at 545 to C at 1765 shown in SEQ ID NO: 1. 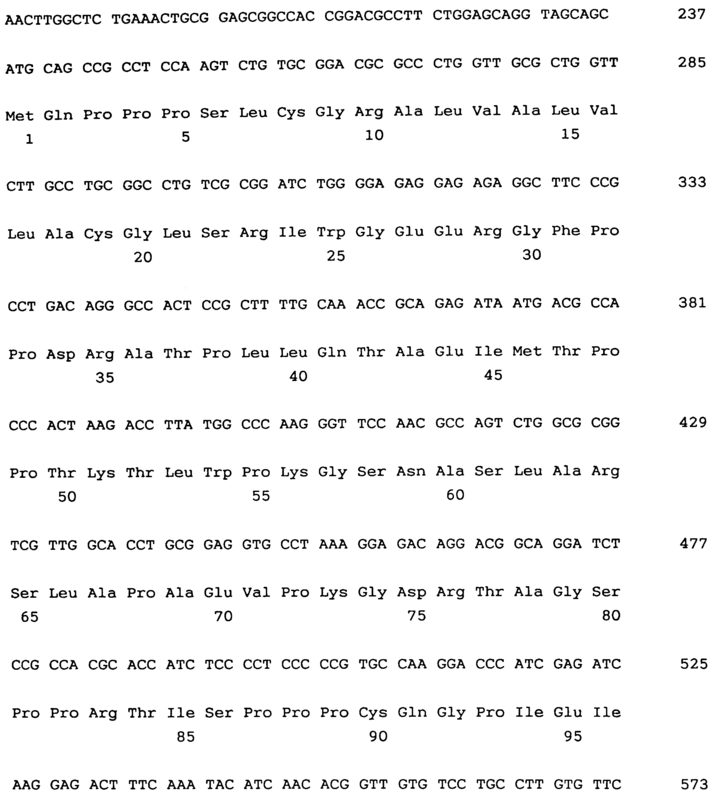 A DNA sequence according to claim 3, comprising a nucleic acid sequence from A at 485 to C at 1765 shown in SEQ ID NO: 1. A DNA sequence according to claim 3, comprising a nucleic acid sequence from G at 1 to T at 4105 shown in SEQ ID NO: 1. A human endothelin receptor comprising amino acid sequence from Glu at +27 to Ser at +442 shown in SEQ ID NO: 2. A human endothelin receptor comprising amino acid sequence from Met at +1 to Ser at +442 shown in SEQ ID NO: 2. A DNA sequence encoding the human endothelin receptor according to claim 7. A DNA sequence according to claim 9, comprising a nucleic acid sequence from G at 316 to T at 1563 shown in SEQ ID NO: 2. A DNA sequence according to claim 9, comprising a nucleic acid sequence from A at 238 to T at 1563 shown in SEQ ID NO: 2. A DNA sequence according to claim 9, comprising a nucleic acid sequence from G at 1 to A at 4301 shown in SEQ ID NO: 2. An expression vector comprising the DNA sequence according to claim 3. An expression vector according to claim 13, which is CDM8-phETIR. A transformant obtained by introducing the expression vector according to claim 13 into a host cell. A transformant according to claim 15, wherein the host cell is a COS-7 cell. A method for producing a human endothelin receptor comprising culturing the transformant according to claim 15 and recovering a produced endothelin receptor. An expression vector comprising the DNA sequence according to claim 9. An expression vector according to claim 18, which is CDM8-pHETBR. A transformant obtained by introducing the expression vector according to claim 18 into a host cell. A transformant according to claim 20, wherein the host cell is a COS-7 cell. A method for producing a human endothelin receptor comprising culturing the transformant according to claim 20 and recovering a produced endothelin receptor. Liao et al. 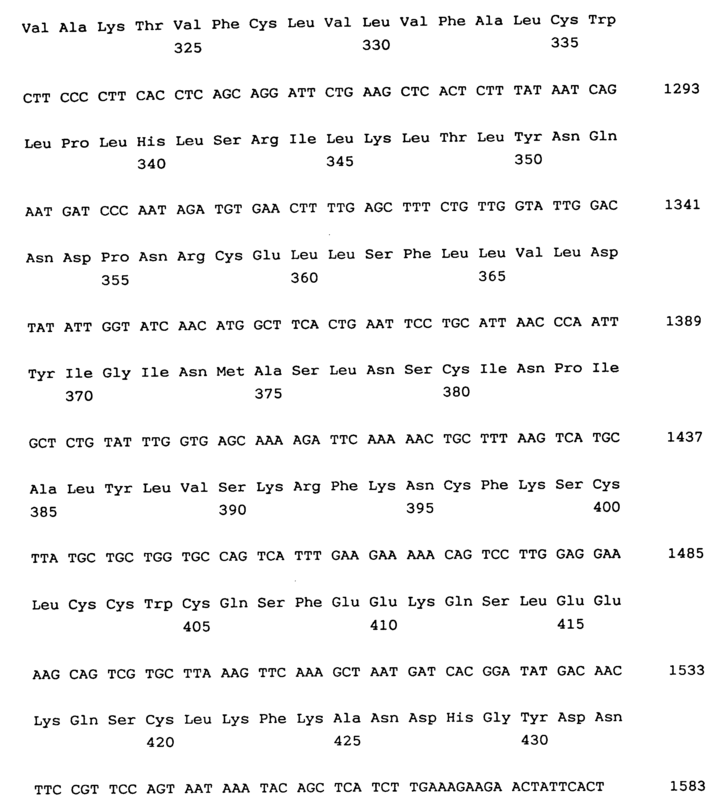 1989 Molecular cloning and expression of a fifth muscarinic acetylcholine receptor. Kambayashi et al. 1993 Molecular cloning of a novel angiotensin II receptor isoform involved in phosphotyrosine phosphatase inhibition. Sugimoto et al. 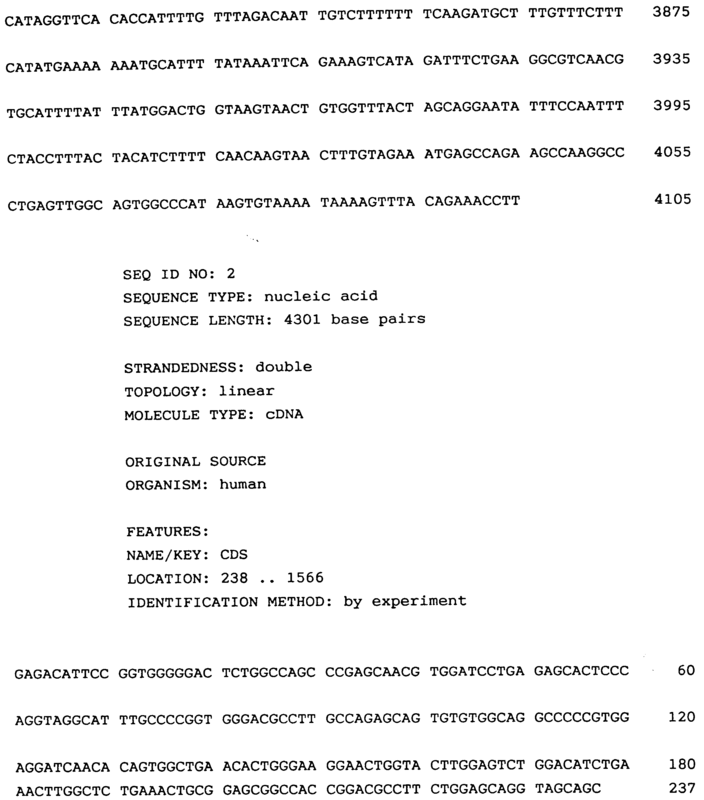 1994 Molecular cloning and functional expression of a cDNA encoding the human V1b vasopressin receptor. Anderson et al. 1992 Functional expression of a probable Arabidopsis thaliana potassium channel in Saccharomyces cerevisiae. Kim et al. 1992 Rat brain expresses an alternatively spliced form of the dihydropyridine-sensitive L-type calcium channel alpha 2 subunit. Ali et al. 1991 A prolactin-dependent immune cell line (Nb2) expresses a mutant form of prolactin receptor. Hori et al. 1992 Distinct tissue distribution and cellular localization of two messenger ribonucleic acids encoding different subtypes of rat endothelin receptors. Gerard et al. 1990 The human neurokinin A (substance K) receptor. Molecular cloning of the gene, chromosome localization, and isolation of cDNA from tracheal and gastric tissues. Suryanarayana et al. 1991 A point mutation in the seventh hydrophobic domain of the alpha 2 adrenergic receptor increases its affinity for a family of beta receptor antagonists. Shigemoto et al. 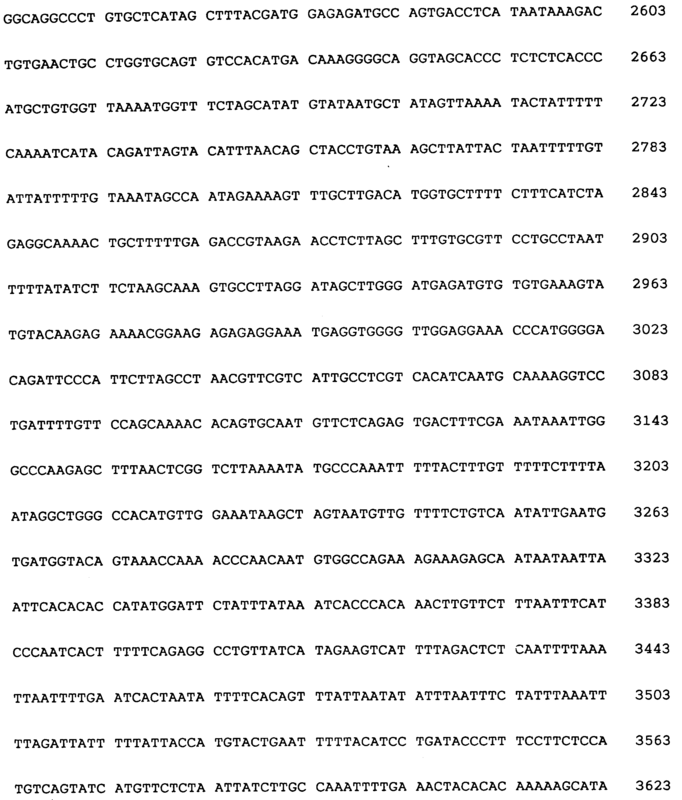 1990 Cloning and expression of a rat neuromedin K receptor cDNA. Hosoda et al. 1992 Organization, structure, chromosomal assignment, and expression of the gene encoding the human endothelin-A receptor.